Champion V Grande Date is a mechanical chronograph with automatic winding where style and technique merge with refinement and a sporty line, to offer a highly versatile balance which expresses all the charisma of this new model. Waterproof to 50 m, it has a 42.80 mm steel case with convex, anti-reflective sapphire glass, a case-back secured by 6 screws enhanced by polished central and satin-finish outer finishes, steel bezel with circular ring in aluminium subject to an “eloxage” treatment and indication of the tachometric scale. The dial features luminescent Arabic numerals and hands, 3 counters - 60 minutes, 12 hours and small seconds - and the grande date at 3 o’clock, developed exclusively for Eberhard & Co. Dedicated to a strong, sporty wrist, Champion V Grande Date is proposed with a variety of dials and bezels and is available on leather strap with personalized “E&Co.” buckle or a Chablis steel bracelet. 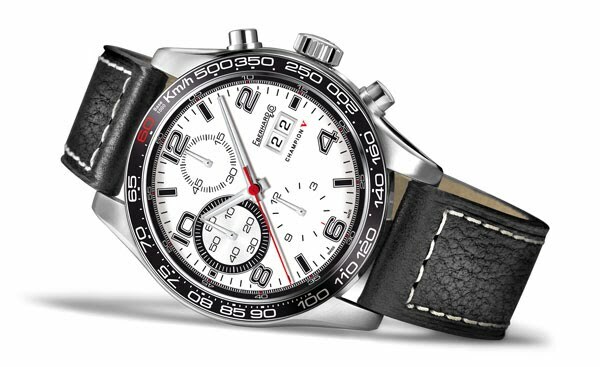 The latest innovation that makes Eberhard & Co. even more Champion !